Lunch and recess are integral parts of an elementary student’s day. Many of us have asked a child, “What is your favorite subject?” and heard the answer “lunch” or “recess”. It makes us laugh, as we expected to hear “reading” or “science” or “art”, but lunch and recess really are a time of so much learning that we could consider them as equal to the other subjects. At ISTP, we are faced with some space issues that impact our schedule. 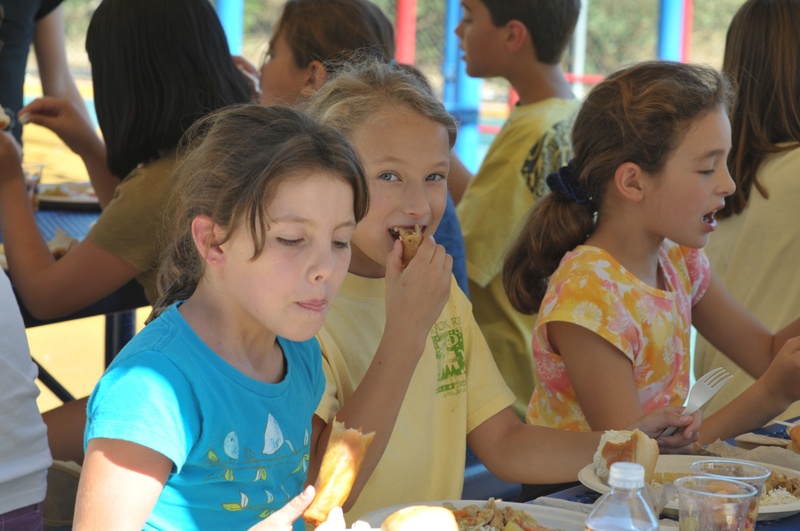 In order to maximize the use of the gym and account for extra classes this year, we found that the solution to a number of issues was to have 1st-5th grades eat at the same time. Having just shy of 300 students all eat at once is a bit of a challenge, and in order to make it work, we knew we needed to assign tables. In years past, we have assigned tables by class, but that meant that a student spent his or her entire day with only his or her class. In a bilingual immersion school where connections and sharing across cultures is key, this has never felt quite right to me. So, this year, we decided to embrace what a number of schools around the country do – create “family groups” for lunch tables, where a few students from different grades are grouped together. Some tables don’t have one grade or another, but for the most part, the tables are a mix of 1st through 5th graders. Each student has a “lunch buddy” – another student from his/her class, so as not to feel alone while getting to know the “family group” at lunch. The rationale behind this choice of assignments is to reach not only across programs, but also across grades. Already, I have seen the older students take leadership roles, helping the group to figure out what job each person would have, and making sure that each person had enough space at the table. The students are getting to know each other and interacting with others they barely know. We aren’t without challenges – two tables needed have yet to arrive, so we’re a bit squished, it’s been a bit choppy in getting everyone to the right table, and we haven’t started with the jobs yet. But once we get settled, I am hoping to see a stronger community, one enriched by connections across ages, backgrounds, and appetites. The last component is that each person at each table will have a job. This teaches about responsibility and communication, as well as allows each student to become an “expert” in the job. We’ll have composting and recycling experts, so we’ll hopefully reduce our waste, and we’ll have “hosts” who will make sure everyone is getting along and offer help when needed, just to name a few of the jobs. Schools that have integrated this at lunchtime have reported calmer, cleaner, and more cheerful lunchtimes. While some students are sad not to sit with all of their best friends at lunch, they do have all of their other recess times to play with one another. We’re hoping that with some guidance and perhaps even activities to do, this can be an opportunity to build new friendships and share experiences with new people. We hope for a stronger and more connected community, and a lunchtime that is full of learning through casual conversation and interactions. It could indeed be seen as a new subject, one in which the curriculum is about opening hearts and minds.